There is nothing more dis-spiriting than hitting a clean shot off the tee or fairway only to see your ball land in the sand. Sometimes, however hard you try, those pesky bunkers just seem to draw your ball in like a magnet. The first thing to remember on these sometimes all too frequent occasions is: don't panic. This is not an insurmountable problem that is going to cause havoc with your scorecard, simply one that requires a cool head and steady hands. There are two types of sand trap strategically placed around the course. The first is a fairway bunker, which as its name suggests lies in wait for a drive or long-iron shot hit too short, too long, or off line. The second type is a greenside bunker, which awaits a wayward approach shot and can easily turn a potential birdie or par into a bogey. Given the fairway bunker may be some way from the pin, there may be the temptation to take a long iron in order to make as much yardage towards the hole as possible. But remember that your first priority is to escape the clutches of the damn thing, so choose a more lofted club. It may not give you a great deal of distance, but it will land you on terra firma. Given that the outer lip of the bunker may be higher than the back, if you are facing a steep incline then it may be advisable to play safe and lift the ball out of the side or back of the bunker. This is not obviously ideal but, again, it will mean you're back on the surface of the fairway and able to use a longer iron to progress down the path towards the green. In terms of contact, be sure that the club face does not connect with the sand before striking the ball. What is needed here is clean contact. Length of shot is not the object of the exercise when sitting in a greenside trap. Given the proximity of your ball to the green, the object is to give the ball a gentle lift on to the putting surface, but not too gentle as to simply hit the lip and roll back in to the sand or overshoot the green and leave yourself a more difficult shot from the surrounding rough or even from another bunker lying in wait on the other side for just such an eventuality. The most obvious club to use in this instance is a sand wedge. Aim to hit in front of the ball so the club face strikes the sand before making contact. This will provide the upward cushioned effect that will limit the forward movement of the ball but give it the height needed to escape the forward slope of the bunker. There aren't many more satisfying moments than foiling the best attempts of the course designer to ruin your round by means of bunkers. But before raising the club in triumph and racing off to take the congratulations of your playing companions, remember to rake over the surface of the sand so it is smooth. 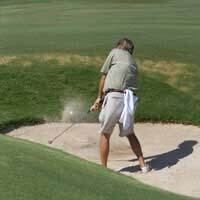 The bunker should be equally challenging for all players and heaps of disturbed sand or footprints left by the previous occupant are not going to make for a fair fight.